How does the Cat Guardians service work? Am I too old to own a cat? If you have registered with our Cat Guardians service, as soon as we are notified that you have passed away, we will arrange to bring your cat or cats into the care of one of our nearby branches or adoption centres. Once there, our dedicated volunteers and staff would care for them, as we would for any cat that needs our help. We would then look after your cat or cats while we try to find them a loving new home that matches their personality and needs. We never put a healthy cat to sleep so we will care for your much loved cat for as long as it takes to find them a new home. 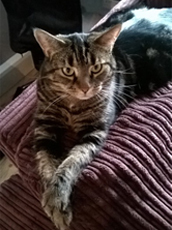 Four year old Elsa was left on her own after her elderly owner sadly passed away. Fortunately she had registered with the Cat Guardians service which meant that we were notified of her passing and we were able to promptly arrange for Elsa to be brought in to the care of our North London Adoption Centre. 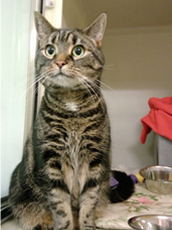 The information provided on the Cat Guardians registration form, which her owner had filled in, meant that our staff and volunteers at the adoption centre had useful information to hand including the types of food Elsa likes to eat, which helped them care for her in the best possible way. It took Elsa a couple of weeks to get used to shelter life, but once she had settled and come out of her shell, she was moved to our Mitcham Homing Centre where this friendly girl very quickly found her new forever home. From day one she has been very happy here with us - a little bit timid in the beginning, but not anymore! She is active and loves playing with us, she eats well (she does like her food! ), and she is very affectionate with us! She loves waking us in the morning for food and attention and, like the cat she is, she wants to be left alone every now and then. We are very happy with her and I believe she is happy with us - her frequent purring is my main hint! By registering to the Cat Guardians service, a huge weight was taken off of her owner’s mind in the last few weeks of her life, knowing that Elsa would be cared for until we found her a new forever home. 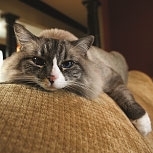 Unfortunately, many elderly people are reluctant to get a cat because of the fear that, should they pass away first, their cat may be left on its own with no one to care for it. The Cat Guardians service means that older cat owners, like Elsa’s, can experience all the benefits of owning a cat, with the knowledge that they have made a plan in place for their cat’s future. Click here to read more about the benefits of owning a cat. Cat Guardians is a free service, however many people who register with the service also choose to remember Cats Protection in their will, as a result of the time and effort we are willing to exert to secure the welfare of their cats. These gifts are vital to us, as more than half of the work we do to help cats and kittens throughout the UK is funded by this incredible generosity. You can find out more about how a gift in your will could make the difference to the lives of cats and kittens in the future in our Gifts in Wills section. You can register to the Cat Guardians service either online or by post. Once we have received your registration form, you will be sent a confirmation pack in the post. Find out how a gift in your will can make a huge difference to the lives of the cats and kittens in our care. 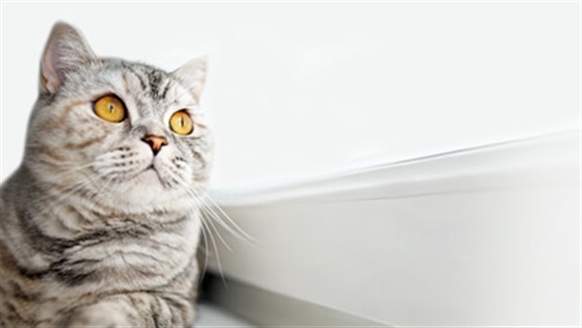 To find out more about the Cat Guardians service and some of the most commonly asked questions; take a look at our FAQ section here.